Judge Neil Gorsuch spoke at the White House on Tuesday night. The nomination of Neil Gorsuch to the Supreme Court foreshadows a renewal of the right-wing judicial activism stalled by the death of Justice Antonin Scalia last year — especially in areas where Justice Anthony Kennedy has allied with his more conservative Republican brethren. But the gravest harm could be to voting rights. There is no doubt that Gorsuch will enable the conservatives, led by Chief Justice Roberts. 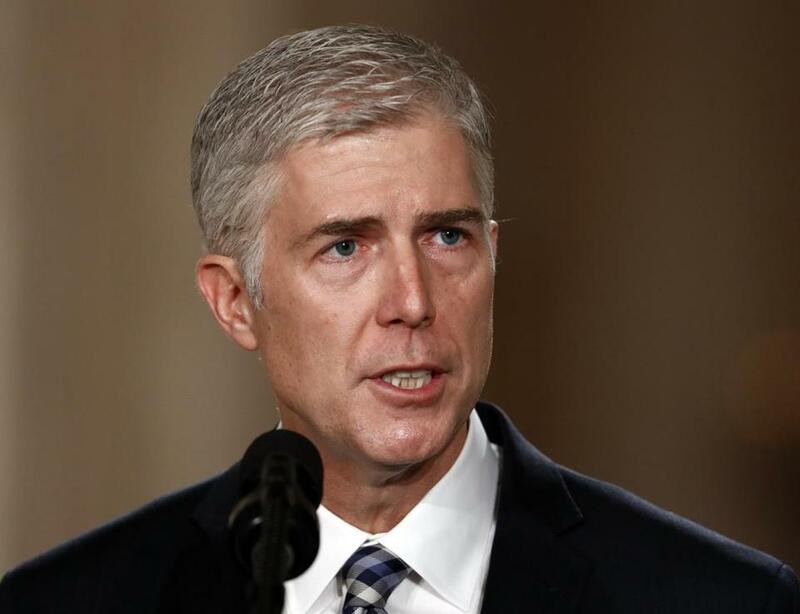 Like his fellow finalists, he was carefully vetted by the Federalist Society, founded in the 1980s to ensure that Republican judicial appointees hew to a stringent legal and political philosophy. Their core purpose is “no more Souters” — meaning Republican justices who commit the apostasy of independence. And it’s worked. An exhaustive study published in 2009 by two political scientists showed that members of the Federalist Society, such as Roberts and Justices Clarence Thomas and Samuel Alito, are twice as likely to cast votes that reflect a conservative ideology than are Republican nonmembers like Kennedy. Thus has the GOP politicized the judiciary. Here law and politics merge. Trump’s lies about massive voter fraud on Election Day have fueled the GOP’s efforts to pass state voter ID laws, which suppress voting by minorities and the poor. Critical to these efforts is Roberts — even as a Justice Department lawyer in the ’80s, he was sharply critical of the manner in which the Voting Rights Act of 1965 protects victims of voter discrimination. That law’s linchpin was “preclearance,” requiring Southern states with a history of voter suppression to obtain federal approval of changes in their voting laws. Then came the 2013 case of Shelby County v. Holder. In a 5-to-4 decision wherein Kennedy joined his Republican colleagues, Roberts held that the South had changed so much since the 1960s that preclearance was unconstitutional. But Roberts had criticized preclearance 30 years before. And the evidence that Republican legislatures were poised to enact voter suppression laws was staring him in the face. In a piercing dissent regarding two such laws, the eminent conservative legal scholar Judge Richard Posner found just that. Of the nine states that passed the most restrictive voter ID laws, he noted, all were politically conservative and governed by Republicans. “Repeated investigations,” Posner stated, “show that there is virtually no in-person voter fraud.” As for why poor and minority voters frequently lack IDs such as drivers licenses, Posner’s answer was simple: a dearth of money, time, or ready access to the agencies which issue them. Enter the chief justice. Although no court has overturned Ramos’s ruling, Roberts has twice played a key role in eroding its effect. In the first instance, he voted to uphold a stay by the US Court of Appeals for the Fifth Circuit blocking immediate enforcement of that ruling — provoking a stinging rejoinder from Justice Ruth Bader Ginsburg that “racial discrimination in elections in Texas is no mere historical artifact.” But Roberts’s second intervention is particularly revealing. Thanks to Roberts, the Texas matter is now the highest-profile voting rights case in the country, a harbinger for all such cases. During his confirmation hearings, attorney general-nominee Jeff Sessions questioned the Obama administration’s decision to sue the state of Texas. Ramos has granted the Trump DOJ’s request for a delay while it reconsiders its opposition to the Texas law. There is little doubt that the Trump administration will support the Texas law — or that Gorsuch will ultimately be confirmed. The slender hope remaining is that — faced with clear evidence of discrimination — Justice Kennedy will vote to strike it down. Absent that, the GOP will succeed in converting Trump’s lies about “rigged elections” to naked truth — not by stuffing ballot boxes, but by starving them. Richard North Patterson’s column appears regularly in the Globe. His latest book is “Fever Swamp.’’ Follow him on Twitter @RicPatterson.